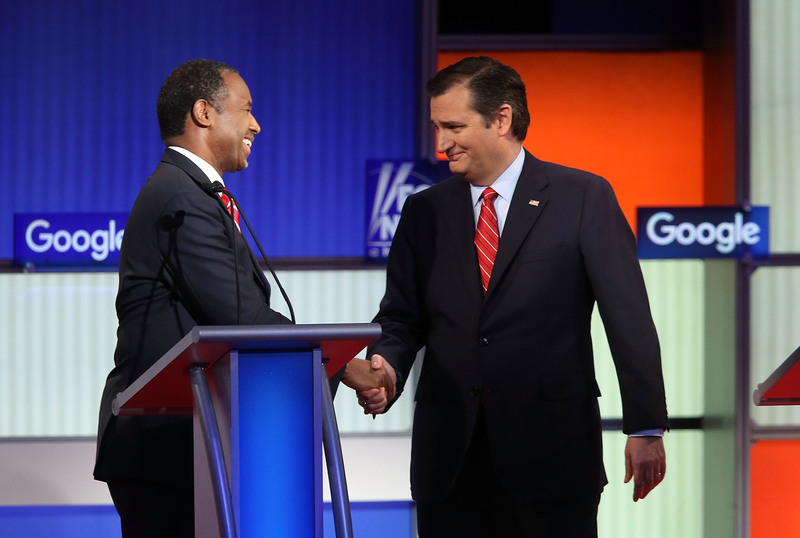 During Saturday night's Republican presidential debate in New Hampshire, a couple of candidates who've been embroiled in some tensions over the last few days finally addressed the controversy toe-to-toe ― Ben Carson and Ted Cruz faced off, discussing the Cruz campaign's false claim prior to the Iowa caucuses that Carson had dropped out of the race. It's no surprise that this got mentioned right at the top of the debate, because it was an unavoidable point of simmering dispute between the two sides since the whole thing came out. Basically, on the same night of the first-in-the-nation Iowa caucuses, the Cruz campaign sent out messages insisting that the retired neurosurgeon had dropped out of the race, and that any Carson-supporting caucus-goers should "urge them to caucus for Ted instead." Needless to say, Carson wasn't happy about this, and he shouldn't have been. Sleazy election day tactics are a time-worn tradition in American politics, and on its face, it sure looked like Carson was the victim of some. So, right near the top of the debate, he called out Cruz over what happened, calling it a classic example of "Washington ethics." Unfortunately, it did happen, and it gives us a very good example of certain types of Washington ethics. Washington ethics say if it’s legal, you do what you have to do to win. My ethics is you do what’s right. Cruz, as you can see in the clip embedded above, offered Carson an apology, although it's hard not to listen to it and think "... really?" Obviously, your mileage may vary. But for my money, Cruz's soft, strenuously earnest-sounding "Ben, I'm sorry" didn't exactly pass the sniff test. Regardless, however, Cruz also said that he called Carson to apologize, and that he assured his primary rival that he'd make the apology in public, too. And Carson didn't dispute those points any further, which perhaps suggests that Cruz is being on-the-level ― about the apology, at least. In fairness, though, it's very easy to apologize after you've already cruised (no pun intended) to an upset win. He did deny any malicious intent regarding the messages, however, insisting it was the fault of an erroneous CNN tweet. Carson seemed a bit unconvinced, to say the least. The initial tweet from CNN was followed by another one within one minute that clarified i was not dropping out. … Everybody can see what happened, and you can make your own judgment. On a night that promised some increased confrontation, with votes in New Hampshire just days from being cast, this was a prototypically testy, loaded exchange. And at the end of the day, Carson is right: the people of New Hampshire must make their own judgment.